You are here: Home » MEDIA » Books » The Glass God (Magicals Anonymous book 2) by Kate Griffin (book review). 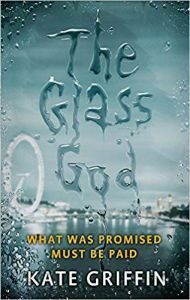 The Glass God (Magicals Anonymous book 2) by Kate Griffin (book review). This book is a humorous urban fantasy, volume 2 in the ‘Magicals Anonymous’ series, which is itself a spin-off of the four-volume ‘Matthew Swift’ series. Swift, the Midnight Mayor, comes into ‘The Glass God’ and its predecessor, ‘Stray Souls’ as a minor or perhaps it’s more accurate to say a major but mainly off-stage character. Central to the ‘Magicals Anonymous’ novels is Sharon Li, a trainee shaman, who is a sort of leader or facilitator of a group of magically talented weirdoes. They include Rhys the druid, Kevin the vampire, Sally the banshee and Gretel the troll, all of them with personal problems. Sharon’s trainer is the small though hugely insulting and personally unacceptable goblin and self-proclaimed world’s second-best shaman, Sammy Elbow. Early on in ‘The Glass God’, Sharon is surprised to be appointed Deputy Mayor due to the disappearance of Matthew Swift. Her task is to find him and restore him to office. At the same time, she has to solve a series of other disappearances and confront the Glass God of the title. Magic abounds here, with every character possessing some powers. Sharon herself can walk through walls and make herself invisible. It’s good that she finds herself and becomes a more accomplished shaman during the course of the two novels. There’s a fast-moving, indeed frenzied plot presented in 96 short chapters. Lots of people die but the humour continues. All the whacky characters from the first book are present again. Kate Griffin also writes YA books under her real name, Catherine Webb, as well as more serious SF and fantasy as Claire North. She’s very inventive in terms of plot and characters. Her small details of setting are delightful, often extremely poetic. The downside of this is that all the Griffin novels are Londoncentric. You just have to suspend disbelief, dive in and let yourself be swept along on multiple magical waves. The Midnight Mayor by Kate Griffin	(book review). « The Divided States Of America Bundle # 2 edited by J. Alan Erwine (ebook review).